City of Lincoln Mayor Chris Beutler recently announced that a venture owned by Nelnet and Speedway Properties has been chosen to redevelop the area of 21st and "N" streets. 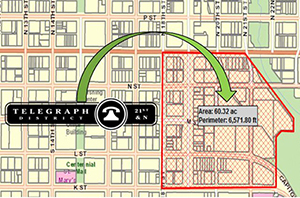 The proposal by East Downtown Development Corporation, known as EaDo, will create a new 20-acre neighborhood called the Telegraph District to honor the impact of the area's telephone companies on the local economy for more than 100 years. Nelnet plans to move hundreds of jobs into the former Windstream office building. The "live-work" development will also include a variety of housing options, retail space and office facilities, and will be attractive to those who like to use alternative transportation. "The community's investment in the Antelope Valley Project and the "N" Street Bikeway are keys to this new development," Mayor Beutler said. "New roads and bridges, new trails and Union Plaza have made the area an attractive option to local entrepreneurs, resulting in this $50 million private sector investment. This is exactly the kind of investment that was envisioned in the third leg of the Antelope Valley Project - community revitalization. "The Telegraph District will revitalize an aging industrial area and continue to build Lincoln's surging economy," he said. "The project exemplifies what we can accomplish when the private and public sector work together for the benefit of the community. The proposed Telegraph District is another demonstration that our vision for Lincoln is working." EaDo was chosen as the developer by a selection committee that reviewed two plans submitted in response to the City's Invitation for Redevelopment Proposals (IFRP). The Telegraph District proposal goes beyond the 5.3 acres included in the IFRP and extends all the way to Antelope Valley Parkway (19th Street), "K" Street to "O" Street. The project will be developed in phases and will total about 650,000 square feet when completed. Design work will begin immediately, with construction on some elements beginning later this year. Beutler said the Nelnet jobs will create a strong employment base to fuel demand for the project's housing and retail services. More than 300 new residential units will be developed, including owner-occupied town homes, rental apartments, lofts and live-work spaces. The project will restore and repurpose existing historic buildings and add new complementary structures to house office, housing and retail spaces.